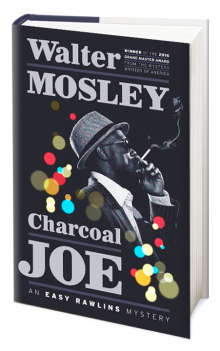 Veteran storyteller Walter Mosley is back with another installment in the life and times of Easy Rawlins in Charcoal Joe. This is terrific news on several fronts: Easy is one of the finest characters in modern-day suspense fiction, complex and artfully drawn; the heroes and villains change sides with some regularity, including the main character; and the story offers more than its share of twists and turns to confound the reader. The titular Charcoal Joe is something of a legend in the circles of Los Angeles bad guys. Easy has stayed outside Joe’s sphere, but all that changes when he is tapped by his longtime frenemy Mouse to look into the murder charges against a young friend of Joe. Violence raises its ugly head, and our hero must take some serious evasive action to protect the lives of his family and loved ones. The Easy Rawlins saga has followed the landlord-turned-detective from the early post-World War II years through the Jim Crow 1950s and up to 1968 in this latest installment. The late ’60s were tumultuous times in Southern California, and Mosley deftly weaves social commentary into the narrative.